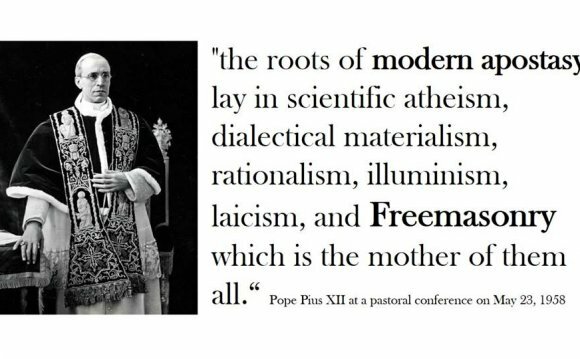 Freemasonry is incompatible using the Catholic belief. Freemasonry shows a naturalistic religion that espouses indifferentism, the positioning that an individual can be equally pleasing to God while residing in any religion. Masonry is really a parallel religion to Christianity. The New Catholic Encyclopedia states, "Freemasonry shows all of the aspects of religion, and therefore it might be an adversary towards the religion from the Gospel. It offers temples and altars, hopes, an ethical code, worship, vestments, feast days, the commitment of reward or punishment within the afterlife, a hierarchy, and initiation and funeral rituals." Masonry is another secret society. Its initiates sign up for secret bloodstream oaths which are unlike Christian morals. The mark Mason swears when he ever discloses the strategies of Masonry - secrets that are trivial and already well-known - he wills to become susceptible to self-mutilation in order to nasty execution. (Most Masons, of course, never would imagine undertaking these punitive measures on themselves or with an errant member). The Chapel has enforced the penalty of excommunication on Catholics who become Freemasons. The penalty of excommunication for joining the Masonic Lodge was explicit within the 1917 code of canon law (canon 2335), which is implicit within the 1983 code (canon 1374). Since the modified code of canon law isn't explicit about this point, some came the mistaken conclusion the Church's prohibition of Freemasonry have been dropped. Consequently of the confusion, shortly prior to the 1983 code was promulgated, the Sacred Congregation for that Doctrine from the Belief released an announcement showing the penalty was still being in pressure. This statement was dated November 26, 1983 and might be present in Roots 13/27 (November. 15, 1983), 450.